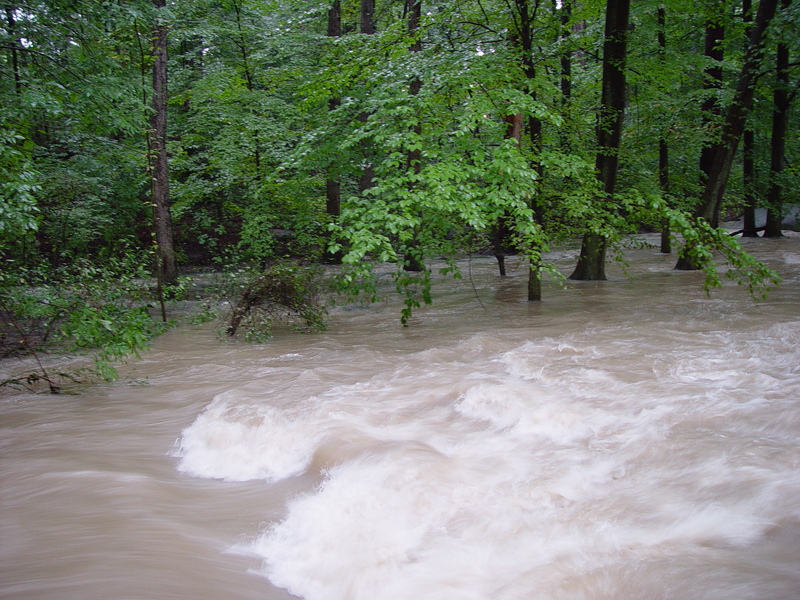 Keep Storm Water Where It Falls – The ecosystems of Reedy Creek, the James River and the Chesapeake Bay benefit greatly when storm water run-off is reduced. 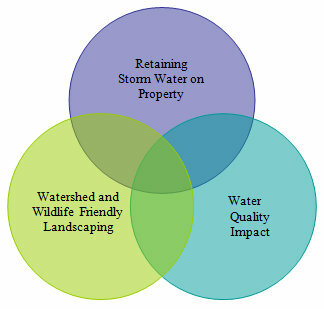 Reduce Water Quality Impact – Any water that does leave the property should have as few pollutants as possible. Your contribution may be small, but the combined contribution from your neighborhood can be significant. Wildlife and Watershed Friendly Landscaping – Appropriate landscaping can help reduce run-off and provide needs for wildlife, particularly when native plant species are used. This is Reedy Creek after a heavy rain. 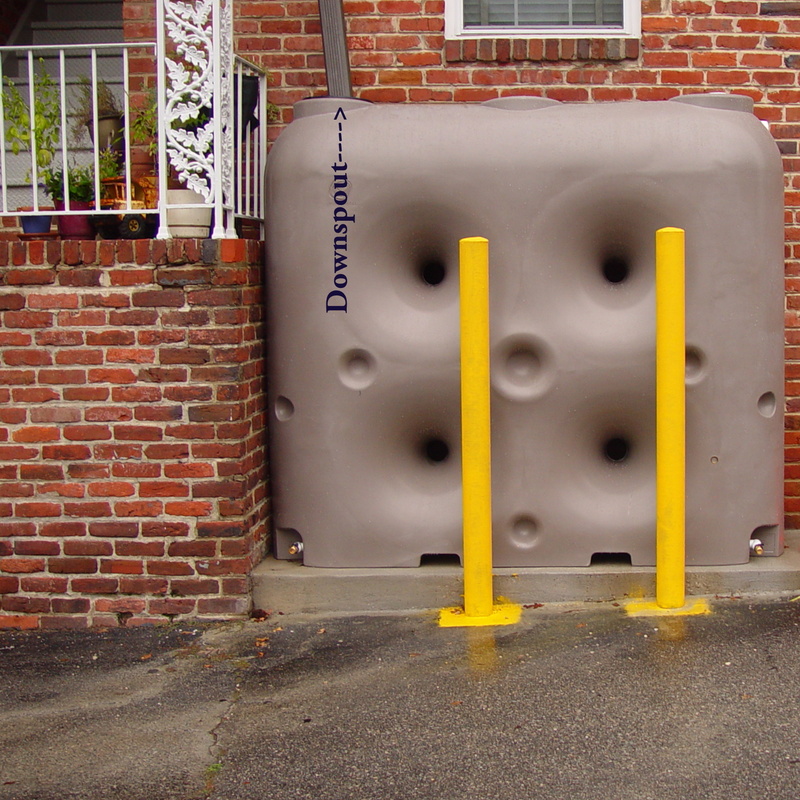 Streets, driveways, parking lots, houses and most any other man-made structure is an impervious surface. Rain that falls on an impervious surface must go somewhere else; most of it goes to Reedy Creek. This huge amount of fast moving water destroys aquatic habitat, erodes stream banks, and contains trash, oil from streets, pet waste, pesticdes, herbicides and fertilizers. The negative impact of storm water run-off then moves from Reedy Creek to the James River and on to the Chesapeake Bay. Collect water in rain barrels or a cistern for later use. If possible, reduce the amount of impervious surface. Reduce Water Quality Impact – Regardless of the efforts made to keep storm water some run-off will occur from most urban properties. water will carry anything on the ground into our streams. Eliminate the use of pesticides, fungicides and herbicides. Eliminate or reduce the use of chemical fertlilzers. Mulch or vegetate areas where soil is bare. Sediment, although completely natural, is a major pollutant in streams. 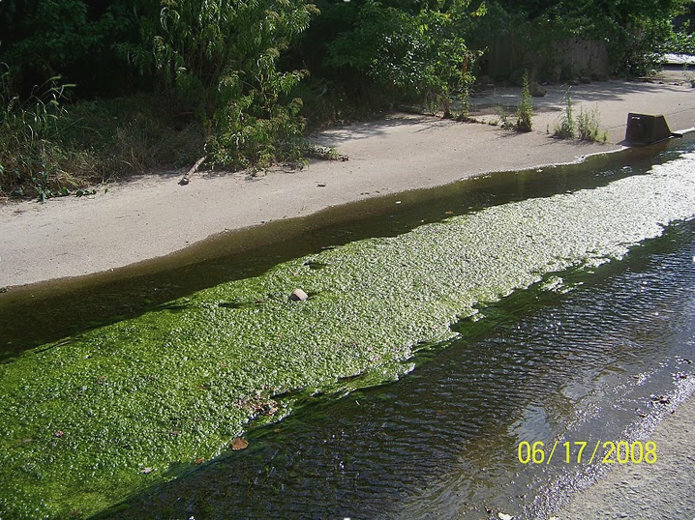 Sediment covers aquatic vegetation, blocking light and fills spaces in rocky streams (like Reedy Creek), eliminating habitat disrupting food webs. Landscape layers – beautiful and functional. Create Wildlife and Watershed Friendly Landscaping – Appropriate landscaping can help reduce run-off and provide needs for wildlife, particularly when native species are used. Decide how much lawn is needed for leisure activities and replace the rest with other plants. Remove non-native plants that are known to be invasive species. 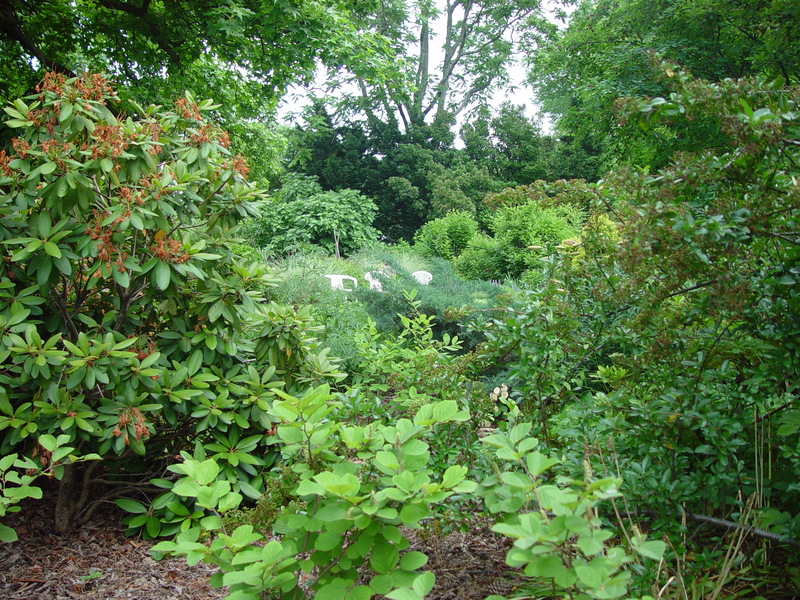 When adding plants to the landscape choose species native to this area. Don’t discard your autumn leaves. Using them as a much will create a fertile and water retentive soil. Create layers in the landscape by planting a variety of perennials, shrubs, and trees; include decicious and evergreen species. Layers increase food and habitat for wildlike and are more effective in retaining rain water. Even leaf litter on the ground functions as habitat! Plant trees. They are the best watershed protectors ever invented.